This entry was posted in General, Misc. 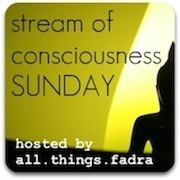 and tagged Fadra Nally, fate, Rafi Bernstein, rafib.com, Stream of Consciousness Sunday by jessica. Bookmark the permalink.